A Global Terrorism Index report out this week indicated that militant extremist group Boko Haram is potentially worse than ISIS, in at least one respect. According to The Institute for Economics and Peace (IEP), Boko Haram, which is sometimes referred to as the Islamic State's West's Africa province (ISWAP), was responsible for the deaths of 6,644 people across Western and Central Africa in 2014, just exceeding ISIS' reported fatalities, which reached 6,073. While the new numbers don't necessarily indicate that Boko Haram is a more dangerous group than ISIS, they hint toward a burgeoning crisis in a region that has largely been ignored. Just this week, militants struck the Nigerian city of Yola in the country's northeast region, detonating explosives in a busy marketplace. The explosion, which took place at around 8 p.m. local time on Tuesday, killed at least 32 and injured an additional 80, according to Red Cross and National Emergency Management Agency officials. 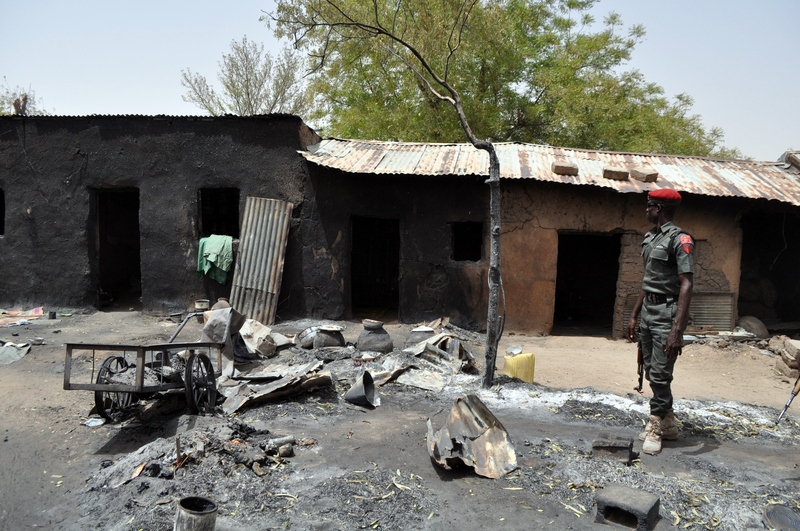 Although Boko Haram did not immediately claim responsibility for the blast, authorities reported that the incident bore similar markers to the group's previous attacks. "The ground near my shop was covered with dead bodies," one witness told reporters. "I helped to load 32 dead bodies into five vehicles." Boko Haram has a bloody and terrifying track record since its founding in 2002 by fundamentalist Islamist cleric Mohammed Yusuf, but it wasn't until recently that the rest of the world outside of Central and Western Africa knew much about the group. That all changed in 2014, when Boko Haram militants, who have sworn to impose Shari'a law, stormed a boarding school in the northeastern town of Chibok, Nigeria and abducted 276 schoolgirls, supposedly with the intent of impregnating them to create a new generation of Islamist militants. Of the few girls who were rescued, nearly all claimed that the militants had forced them to marry their captors. Many said that the militants had raped them repeatedly. "They chose the ones they wanted to marry," one girl told The New York Times in an interview this past May, following her rescue. "If anybody shouts, they said they would shoot them." Worse still, many of the girls were forced to accept their captors' religion before being trained to become militants as well. A report by Amnesty International in June specified that many of the captured girls had been taught to kill. "The abduction and brutalization of young women and girls seems to be part of the modus operandi of Boko Haram," Amnesty International's Africa director Netsanet Belay told BBC News that month. Some of the captured girls recalled seeing classmates slitting the throats of men in their former village. "[The Boko Haram fighters] forced the Christians to lie down," one girl recounted. "Then the girls cut their throats." Like ISIS, Boko Haram has also engaged in suicide attacks. "Boko Haram started using suicide bombers, I think, as early as June, 2014," Mausi Segun, Nigeria researcher for Human Rights Watch, told NPR's Morning Edition in October. "It's easier for women and girls to slip into crowds where they can carry out mass atrocities than for men ... [so we've] begun to see young girls, some as young as 10, carrying out these attacks in horrible places." Boko Haram's habit of using children and young women to perform their dirty work rivals ISIS' wide net of "volunteer terrorists," many of whom can reach out to the group using social media and who then pledge their allegiance to the group by carrying out acts of terror on their own. For Boko Haram, capturing civilians and forcing them into the life of a militant jihadist seems to be standard operating procedure, but it also carries with it the necessity of increased bloodshed in order to accomplish the task at hand. The militant group also has a tendency to target schools and universities. According to a report released by the United Nations on Monday, Boko Haram militants have destroyed over 1,000 schools since the beginning of this 2015 alone. Since 2009, the U.N. stated, Boko Haram has killed a total of 17,000 individuals altogether. Despite ISIS' wider reach, global terror watchdogs have had a heavy battle to wage against the onslaught of Boko Haram violence in the previous months. Fortunately, it seems the tide may be turning: According to regional officials in northeastern Nigeria, the country's military has been able to capture former Boko Haram strongholds in recent weeks, forcing militants to scatter and weakening their hold. "Now the fight is everywhere, so they are on the run," Hussaini Monguno, security adviser to Borno State governor Kashim Shettima, explained to The New York Times on Sunday. As the international community gears up again to tackle the growing threat of ISIS, it would be wise to keep a close eye on the waning, but deadly Boko Haram movement as well — one small slip-up is all it will take for the group to gain power and begin terrorizing Central and Western Africa once more.